Motorola and Lenovo are all set to reveal the newest addition to Moto Family i.e. the Moto M and the Moto M Plus. Both the Smartphones are Mid-Tier phones which will probably replace the Moto X.
Moto M: Codenamed "Kung-Fu" The Smartphone features a a full HD 5.5" display, a MediaTek processor with 4GB of RAM, and a 16/8MP camera set up. Its model number is XT1662 and runs Marshmallow. 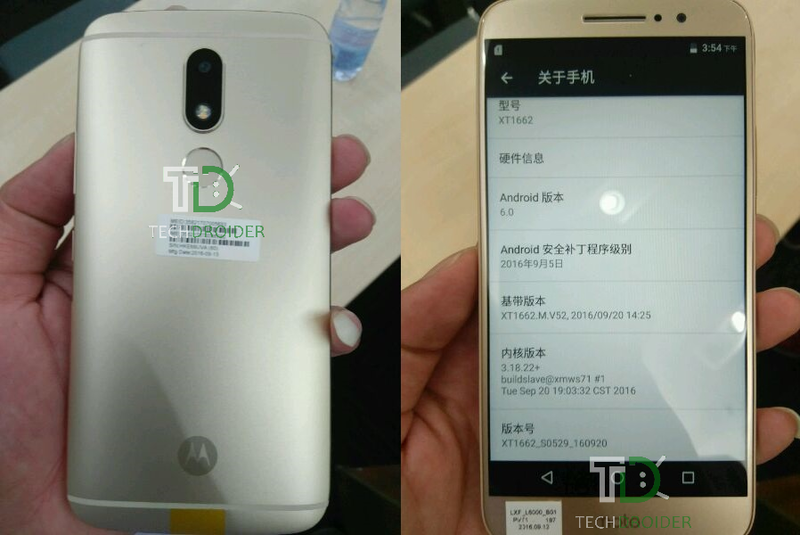 Today, We got another set of Real Life Images of Motorola Moto M from Anonymous tipster. In terms of design, expect a gold aluminum unibody and a rear fingerprint scanner. No, it's not on the Motorola dimple. They chose to include the logo on the bottom of its back. The Device has tiny side bezels which makes it looks premium. Moto M will be the first Motorola Smartphone to feature a rear-facing fingerprint sensor and the first Moto Phone to support "4G+" (which is capable of 90Mbps speeds). The Smartphone comes with Pre-Installed Microsoft Apps including.